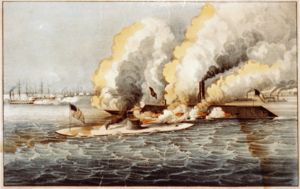 The Battle of Hampton Roads, often called the Battle of Monitor and Merrimack, was a naval battle of the American Civil War, famous for being the first fight between two ironclad warships, the USS Monitor and the CSS Virginia (the latter rebuilt from the burned-out hull of the USS Merrimack). The principal confrontations took place on March 8 and March 9, 1862, off Sewell's Point, a narrow place near the mouth of Hampton Roads, Virginia. The naval battle lasted two days. The first day saw Virginia wreak havoc on wooden Union ships. However, on the second day Monitor arrived and initiated the famous duel of the ironclads. The battle, though inconclusive, received worldwide publicity. After the battle, it was clear that ironclad ships were the future of naval warfare. Lessons from this naval encounter would be applied in the sea battles of World War I and World War II during which much depended on the safety of cargoes of food and arms. Wooden navies became obsolete after this battle, and new technologies were developed to improve the efficiency and the battle-power of iron-clad ships. From the outset of the Civil War, United States President Abraham Lincoln implemented a plan to bring the Confederate states back into the Union. General Winfield Scott's Anaconda Plan became the blueprint for the Union Army's strategy. Lincoln would use the larger and more powerful Union Navy to cut the Confederacy off from the rest of the world by blockading the Confederacy's coastline on the Atlantic Ocean and the Gulf of Mexico, and controlling the Mississippi River Valley with gunboats. Lincoln ordered the blockade as hostilities escalated. 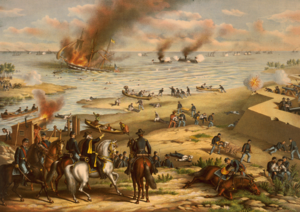 In the spring of 1861, land-based Confederate forces were able to seize Norfolk, Virginia, and the surrounding area on the south side of Hampton Roads. 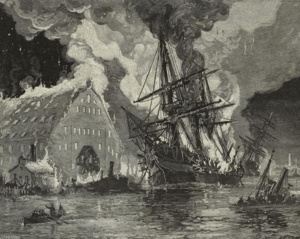 Bluffed into a bloodless retreat by southern efforts headed by railroad president William Mahone, the Union Navy burned and evacuated the Gosport Shipyard, located in Portsmouth, across the Elizabeth River from Norfolk, destroying nine ships in the process, including the Boston-built frigate USS Merrimack. However, in the haste and confusion, Merrimack was only burned to the waterline. The evacuation left only Fort Monroe at Old Point Comfort on the Virginia Peninsula on the north side of Hampton Roads (across from Sewell's Point at the mouth) under Union control in Tidewater, Virginia. The channel ran close to the northern side, however, and Fort Monroe on the mainland was supplemented by an armed installation immediately south of the channel on a man-made island (later called Fort Wool). Occupation of Norfolk gave the Confederacy its only major shipyard and thousands of heavy guns. CS Brigadier General Walter Gwynn, who commanded the Confederate defenses around Norfolk, erected batteries at Sewell's Point, both to protect Norfolk and to control Hampton Roads. The Union dispatched a fleet of wooden warships to Hampton Roads to enforce the blockade. Fort Wool and Fort Monroe combined to secure access from Hampton Roads to both the Chesapeake Bay and the Atlantic Ocean. However, the waters inland on the James and Elizabeth Rivers were controlled by the Confederate States Navy, which was also using wooden warships. Despite some skirmishes, neither navy was able to overcome the other. The impasse continued through the remainder of 1861, and into early 1862. Ironclads were warships whose hulls carried iron plates for protection. The world's first ironclad battleship, the French La Gloire, had been launched in 1859 and the use of iron armor was still a developing technology in North America at the outset of the Civil War. One of the first acts of the Confederate Congress was to try to acquire ironclad warships, either buying them from overseas or converting the vessels which were to hand. Aware of the Confederacy's plans, the Union also began to construct ironclads early in the war. The first Union and Confederate ironclads were very odd-looking in comparison with contemporary warships and also very different from each other. Neither had been completed to the full satisfaction of their respective designers when they sailed into history at Hampton Roads. During the Union Navy's hurried evacuation of the Gosport Shipyard at Portsmouth, Virginia, in June 1861, Union troops under the command of Captain Charles Wilkes set fire to the powerful steam frigate USS Merrimack, a ship that originally set sail from Boston Shipyard at Charleston, Massachusetts in June 1855. The fire only reached to the waterline, leaving a burnt-out but still floating hull. Based upon plans drawn up by Lieutenant John M. Brooke, the shipyard, under Confederate control, rebuilt her with iron plating over a reduced superstructure. She was commissioned as CSS Virginia on February 17, 1862. The stern measured in at 178 ft (54 m) and the bow to stern length was 263 ft (80 m). Feeling that iron armor would make cannon fire ineffective against ships, the designer of Virginia had her equipped with a ram, a weapon normally associated with ancient galleys and not then used in contemporary warships. Despite an all-out effort to complete her, Virginia still had workmen on board when she sailed and was rushed into service without the customary sea trials or under-way training. The USS Monitor was of a totally new design and a favored project of President Lincoln. 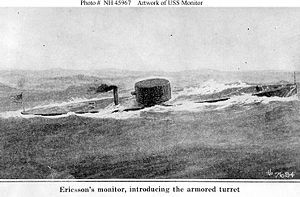 The unique design engineered by John Ericsson featured an innovative rotating gun turret that housed two 11 inch (280 mm) Dahlgren smooth bore cannon. It also had a low profile in the water, and only a small part of the deck and the gun turret were visible to the enemy. Monitor's hull was constructed at the Continental Iron Works in the Greenpoint section of Brooklyn, New York, and the ship was launched there on January 30, 1862. Her armor had to be reduced from the original design to improve freeboard, but even with the reduced armor her total freeboard was only 14 inches (35 cm). She was commissioned by the Union Navy on February 2, 1862. The vessel from stern to bow measured only 172 ft (52 m) and she was a mere 41 ft (12 m) wide. Monitor was one of the most innovative naval vessels of all time. Parts were forged in nine foundries and brought together to build the ship. The entire process took less than 120 days. Despite the rapid construction, Lincoln was greatly frustrated that Monitor's delivery from the builder was late. It was rushed to Hampton Roads, arriving later on the very day that its Confederate counterpart had made a stunning debut at the expense of the Union Navy, effectively diminishing numerous wooden ships that attempted to counter it. 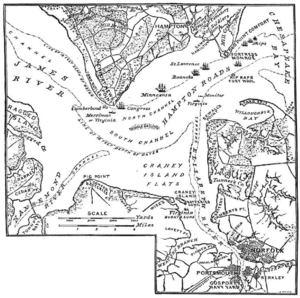 Map of events of the Battle of Hampton Roads. The battle began when the large and somewhat unwieldy CSS Virginia of the Confederate States Navy steamed into Hampton Roads on the morning of March 8, 1862, and set to work attempting to break the Union blockade. Virginia, commanded by Captain Franklin Buchanan, was supported by Raleigh and Beaufort, and accompanied by Patrick Henry, Jamestown, and Teaser. The Union Navy had 188 guns and 2,000 men at hand. Virginia headed directly for the Union squadron. The USS Roanoke first sighted the ironclad. Virginia opened the engagement when less than a mile distant from USS Cumberland and the firing became general from blockaders and shore batteries. 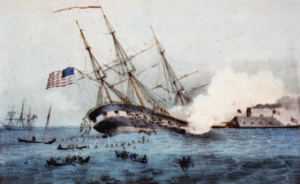 Virginia rammed Cumberland below the waterline and she sank rapidly, "gallantly fighting her guns," Buchanan reported in tribute to a brave foe, "as long as they were above water." Buchanan next turned the Virginia on USS Congress. Seeing what had happened to Cumberland, the captain of Congress ordered his ship grounded in shallow water. By this time, the James River Squadron, commanded by John Randolph Tucker, had arrived and joined the Virginia in its attack on the Congress. This lasted for an hour, after which the badly-damaged Congress surrendered. While the surviving crewmen of Congress were being ferried off the ship, a Union battery on the north shore opened fire on Virginia attempting to target Confederate seamen boarding the vessel. In the midst of the firing Buchanan was hit by a shot and carried out to safety. In retaliation, the captain of the Virginia ordered Congress fired upon with red-hot shot and incendiary shell. 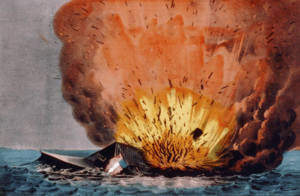 Congress later exploded when fires caused by the rebel ironclad ignited her magazine. The Virginia was also damaged. Shots from Cumberland, Congress, and Union troops had riddled her smokestack, reducing her already low speed. Two of her guns were disabled and several armor plates had been loosened. The Union had lost 300 men killed and another 100 wounded. The sinking of Cumberland by the iron-clad Virginia. Meanwhile, the James River Squadron had turned its attention to USS Minnesota which had left Fort Monroe to join in the battle and had run aground. After Virginia had dealt with the surrender of Congress, it joined the James River Squadron despite its damage. Because of her deep draft, Virginia was unable to get close enough to do significant damage, and as the fight wore on, darkness prevented the rest of the squadron from aiming their guns to any effect. Virginia left with the expectation of returning the next day and completing the destruction of the Union fleet. She retreated into the safety of Confederate-controlled waters for the night. The day was Virginia's, but it was not without loss. Part of her ram had wrenched off and was left embedded in the side of the stricken Cumberland. While Virginia was firing on the shore battery, Captain Buchanan's thigh bone was broken by a musket ball. This necessitated turning over command to Lieutenant Catesby R. Jones. Buchanan's leg was subsequently amputated. The conduct of the Officers and men of the squadron … reflects unfading honor upon themselves and upon the Navy. The report will be read with deep interest, and its details will not fail to rouse the ardor and nerve the arms of our gallant seamen. It will be remembered that the Virginia was a novelty in naval architecture, wholly unlike any ship that ever floated; that her heaviest guns were equal novelties in ordnance; that her motive power and obedience to her helm were untried, and her officers and crew strangers, comparatively, to the ship and to each other; and yet, under all these disadvantages, the dashing courage and consummate professional ability of Flag Officer Buchanan and his associates achieved the most remarkable victory which naval annals record. It had been a frightening and demoralizing day for the Union Navy. Late that night, USS Monitor, commanded by Lieutenant John L. Worden, arrived in Hampton Roads. 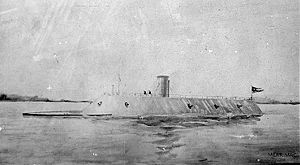 The Union ironclad had been rushed to Hampton Roads in hopes of protecting the Union fleet and preventing Virginia from threatening Union cities. "Upon the untried endurances of the new USS Monitor and her timely arrival," observed Union Captain John A. Dahlgren, "did depend the tide of events." The next morning, on March 9, 1862, after undergoing repairs, Virginia returned to finish off the grounded Minnesota. The way was blocked by the newly arrived Monitor, which the commander of the rebel ship later described as "little more than a cheesebox on a raft." The Virginia initially fired on the Minnesota, but as she approached shoal waters she was forced to instead turn her guns onto the Monitor. After fighting for hours, mostly at close range, neither could overcome the other. The smaller and nimbler Monitor had a revolving turret, and was able to outmaneuver the Virginia, but neither ship proved able to do significant damage to the other. At one point Virginia was accidentally run ashore, but managed to eventually free herself. Finally, Virginia retreated, leaving Monitor and the rest of the Union fleet in possession of the "battlefield." Both sides claimed victory. Strategically, Virginia was unable to dislodge the Union blockade and the Minnesota had been saved, and so while the tactical battle was inconclusive, the strategic balance remained in the Union's favor. Still, the Confederacy was able to retain control over the James and Hampton Roads. Although the two ships both left the encounter fully functional, Monitor's guns were considerably more powerful than Virginia's and managed to crack Virginia's armor plate in several places whereas the Virginia only managed to dent the Monitor's armor. Significantly, Monitor's crew used primarily solid shot and aimed at Virginia's upper works. When he heard about this, designer Ericsson was furious, exclaiming that if the crew had used explosive shells and aimed for the waterline, they would have sunk Virginia with ease. During the next two months, Virginia made several sorties to Hampton Roads hoping to draw Monitor into battle. Most days Virginia would slowly steam down the Elizabeth River to the Confederate forts on Craney Island or Sewell's Point. Across Hampton Roads, Monitor and a vast number of Union ships waited for the Confederate ship to venture down towards Fort Monroe. The Union plan was to engage Virginia in waters of their own choosing. Monitor was under presidential orders not to enter a fight unless it was absolutely unavoidable. The Union Navy Department had leased several large steamers for the express purpose of running Virginia down. The plan was to wait for the Confederate ship to venture into deep water and the large steamers would attempt to run up on Virginia's submerged deck ends and hopefully sink the ship. Virginia did venture into Hampton Roads on two occasions and attempted to entice Monitor out to fight, but owing to the presidential order, the challenge went unanswered. What was probably the most anticipated naval battle of its day never materialized. USS Monitor and CSS Virginia never fought each other again. The broad impact of the battle on naval thinking was summarized by Captain Levin M. Powell of USS Potomac writing later from Vera Cruz: "The news of the fight between the Monitor and the Merrimack has created the most profound sensation amongst the professional men in the allied fleet here. They recognize the fact, as much by silence as words, that the face of naval warfare looks the other way now and the superb frigates and ships of the line … supposed capable a month ago, to destroy anything afloat in half an hour … are very much diminished in their proportions, and the confidence once reposed in them fully shaken in the presence of these astounding facts." And as Captain Dahlgren phrased it: "Now comes the reign of iron and cased sloops are to take the place of wooden ships." After the Battle of Hampton Roads, neither ship played much of a subsequent part in the war, and neither survived 1862. Events on land surrounding Hampton Roads forced the Confederates to abandon the Norfolk area. As the evacuation of Norfolk and Portsmouth got under way on May 10, 1862, the officers and crew of Virginia were left with few options. Commander Josiah Tattnall realized that his ship had too much draft to make it up the James River to Richmond, and there was little chance of successfully escaping out of Hampton Roads past the waiting fleet of Union warships off Fort Monroe that were surely anticipating just such a move. To keep her from being captured, early on the morning of May 11, 1862, Tattnall ordered Virginia run aground at Craney Island and set afire. After burning fiercely for about an hour, the flames reached her magazine, and the ship was destroyed by a great explosion. More than 10 years after the end of hostilities, on May 30, 1876, the wreck of the Virginia was raised and transported back to the ship yard at Portsmouth where it was broken up. Portions of the Virginia, including her armor, anchor, and guns, have been displayed for many years at the Norfolk Naval Shipyard in Portsmouth and the Mariners' Museum in Newport News. The anchor of the Virginia sits on the lawn in front of the Museum of the Confederacy, established in Richmond in 1890. 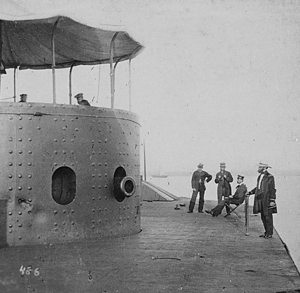 USS Monitor became the prototype for the monitor warship type. Many more were built, including river monitors, and they played key roles in Civil War battles on the Mississippi and James rivers. However, while the design proved exceptionally well-suited for river combat, the low-profile and heavy turret caused poor seaworthiness in rough waters. In December of 1862 the Monitor was ordered to Beaufort, North Carolina to assist in the Union blockade of the Carolinas. While in tow by the USS Rhode Island the ships encountered a heavy gale. The Monitor took on water and sank on New Year's Eve, December, 1862, in the Atlantic Ocean off Cape Hatteras, North Carolina in an area known as the Graveyard of the Atlantic. In 1973, the wreck was located. The name of the warship which served the Confederacy in the famous Battle of Hampton Roads has been a continuing source of confusion. Called the USS Merrimack, she was a frigate of the United States Navy which also records the Confederate ironclad's name as Virginia. The CSS/USS Merrimac was a paddle wheel steamer around the same time, the name being an abbreviation of the same river Merrimack was named after. Both spellings are still in use around the Hampton Roads area. The small community in Montgomery County near the location where the iron for the Confederate ironclad was forged is now known as Merrimac, Virginia. Some of the iron mined there and used in the plating on the Confederate ironclad is displayed at the Norfolk Naval Shipyard in Portsmouth. Other pieces are on display at the Mariners' Museum in Newport News and the Museum of the Confederacy in Richmond, where the anchor has resided for many years. The Jamestown Exposition was one of the many World's Fairs and expositions that were popular in the United States early in the twentieth century. It was held from April 26, to December 1, 1907, at Sewell's Point on Hampton Roads, near Norfolk, and it commemorated the tricentennial (300th) anniversary of the founding of the Jamestown Settlement. One of the more popular attractions was a re-creation of the Battle of Hampton Roads, which had taken place 45 years earlier within sight of the exposition location. The exterior of the Merrimack-Monitor Building looked somewhat like a battleship while the interior contained a large circular description of the battle. In 1992, Virginia's Department of Transportation completed the 4.6-mile (7.4 km) Monitor-Merrimac Memorial Bridge-Tunnel. This important traffic link carrying Interstate 664 crosses Hampton Roads very close to the site of the famous clash of the ironclads. It cost $400 million to build and includes a four-lane tunnel that is 4,800 feet (1,460 m) long, two man-made portal islands, and 3.2 miles (5.1 km) of twin trestle. Northbound traffic is provided an exceptional view of the location of the historic battle. After resting undetected on the ocean floor for 111 years, the wreck of Monitor was located by a team of scientists in 1973. The remains of the ship were found 16 miles (26 km) off Cape Hatteras, on a relatively flat, sandy bottom at a depth of about 240 feet (73.2 m). Monitor's hull lies upside down, with her deck resting on her displaced gun turret. In 1987, the site was declared a National Historic Landmark, the first shipwreck to receive this distinction. Because of Monitor's advanced state of deterioration, timely recovery of remaining significant artifacts and ship components became critical. Since then, using new technologies, hundreds of fragile artifacts, including the innovative turret and its two Dahlgren guns, an anchor, steam engine, and propeller, have been recovered and were carefully transported back to Hampton Roads to the Mariners' Museum in Newport News, Virginia. For several years, they were conserved in special tanks to stabilize the metal. The new USS Monitor Center at the Mariners' Museum officially opened on March 9, 2007, and a full-scale replica of the Monitor, the original recovered turret, and many artifacts and related items are now on display. Some artifacts from the CSS Virginia are also on display. A 1991 made-for-TV movie, Ironclads, depicts the battle. Les Bleus de la marine, an album of the Belgian bande dessinée series Les Tuniques Bleues, features a story set against the backdrop of the battle of Hampton Roads. ↑ James DeKay, Monitor (New York: Ballantine, 1997), 206. ↑ Gene A. Smith, "Monitor Versus Virginia," in Encyclopedia of the American Civil War: A Political, Social, and Military History, eds. David S. Heidler and Jeanne T. Heidler (New York: W. W. Norton & Company, 2000), 1348. ↑ The Civil War, DVD, directed by Ken Burns (1990; Los Angeles, CA: PBS Paramount, 2004). ↑ 5.0 5.1 Dictionary of American Naval Fighting Ships, Merrimack, Merrimack Retrieved April 27, 2015. ↑ Dictionary of American Naval Fighting Ships, Merrimac, Merimac Retrieved April 27, 2015. ↑ Les Tuniques Blues, Les Bleus de la marine. Retrieved August 23, 2007. Milton, Keith. "Duel At Hampton Roads." Military Heritage 3, no. 3 (2001): 38-45, 97. All links retrieved December 12, 2016. A record of events in Norfolk County, Virginia, online text with an entire chapter on the battle. Library of Congress website has a large, detailed color map of the events of the battle. History of "Battle of Hampton Roads"
This page was last modified on 12 December 2016, at 23:08.